Per his military service record (Depot), Edgar Dawson was born at Bathurst, N.S.W. He gave his age as 29 years and 7 months, his marital status as married, and his occupation as labourer. His description on his Certificate of Medical Examination was height 5 feet 8 ¼ inches tall, weight 116 lbs., with a dark complexion, bluish eyes, and brown hair. His religious denomination was Church of England. He claimed that he had no previous military service. His next of kin was recorded on his Attestation Paper of Persons Enlisted for Service Abroad as his wife, Mrs E. [Coral Edith] Dawson, Post Office, Bathurst N.S.W. He completed his medical examination, and was attested by Lieutenant Frank Middenway, at Ashfield on 11th November 1915. However, his Oath in his Attestation Paper was dated from 4th November 1915, and the date of 4th November 1915 was recorded at the bottom of the front page of his Attestation Paper near his signature, which was the day the Coo-ees marched from Hartley to Mt. Victoria. An initial Application to Enlist in the Australian Imperial Force form dated 2nd November 1915 in his service record shows that he undertook a preliminary medical examination at Bathurst on 2nd November 1915, and “Route March Mt. Victoria” is written at the top of this form, so it appears he may have first presented to join the Coo-ee March at Mt. Victoria. On 15th January 1916 Private Dawson went absent without leave. On 17th February 1916 he was posted as a deserter. Private Dawson returned to the Liverpool Camp with a Doctor’s Certificate dated 19th February 1916 stating he had been suffering from Entero-colitis. His service record shows that on 22nd February 1916 his wife sent a letter requesting his discharge on the grounds that she believed that he was ‘not physically robust to go to the front’. On 25th February 1916 Private Dawson went before a Medical Board that found him fit for military service. On 3rd March 1916 Private Dawson’s wife sent another letter requesting his discharge due to their three young children aged 7, 5, and 3 years, being sick with measles. She sent another letter on 7th March 1916 stating that she also was sick and was not able to look after their children on her own. These letters did not appear to have any effect, and on 13th March 1916 Private Dawson went absent without leave again. On 13th April 1916 Private Dawson was apprehended by the Military Police and taken to Victoria Barracks. On 20th April 1916 he was discharged from the Australian Imperial Force ‘at wife’s request’. 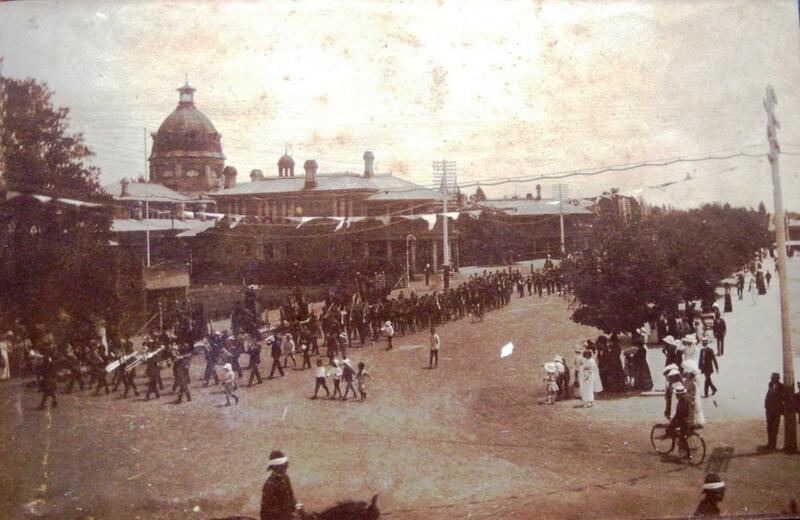 Procession welcoming the Coo-ees to Bathurst, 28/10/1915. Photograph courtesy Dorothy Clampett and Margaret Murden. This photograph of the procession that welcomed the Coo-ees to Bathurst on Thursday 28th October , was taken from the corner of Russell Street and William Street, looking towards to Bathurst Court House. The photograph partly shows two mounted police in the foreground, on William Street, then a brass band, following by men carrying rifles, at the head of a procession marching along Russell Street, next to King’s Parade. Trees obscure the rest of the procession. Spectators line the street. Bunting hangs across the road. The majestic Bathurst Court House can be seen in the background. This photograph is from the family album of Lieutenant Frank Middenway’s daughters, now held by his granddaughters, Dorothy Clampett and Margaret Murden. 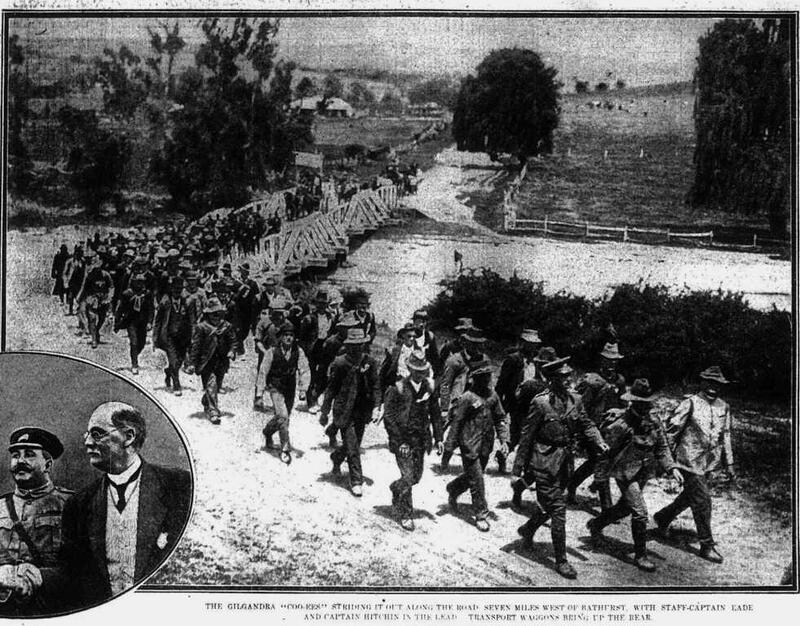 Lieutenant Middenway, from Lithgow Army Camp, assisted with recruitment on the Coo-ee March from Lithgow to Sydney. This photograph was recently published in an article titled ‘Coo-ee’, written by Ann O’Connell, in ‘Ashfield Answers the Call’, Ashfield History No. 20, Journal of the Ashfield and District Historical Society Inc.
BIG CROWDS IN THE STREETS AND PARK. Down the hill along Lambert-street at about 4 o’clock yesterday afternoon came a procession unique in the history of Bathurst, and one which portended the serious manner in which the serious crisis in which the Empire is at present involved is taken by the males of the community. 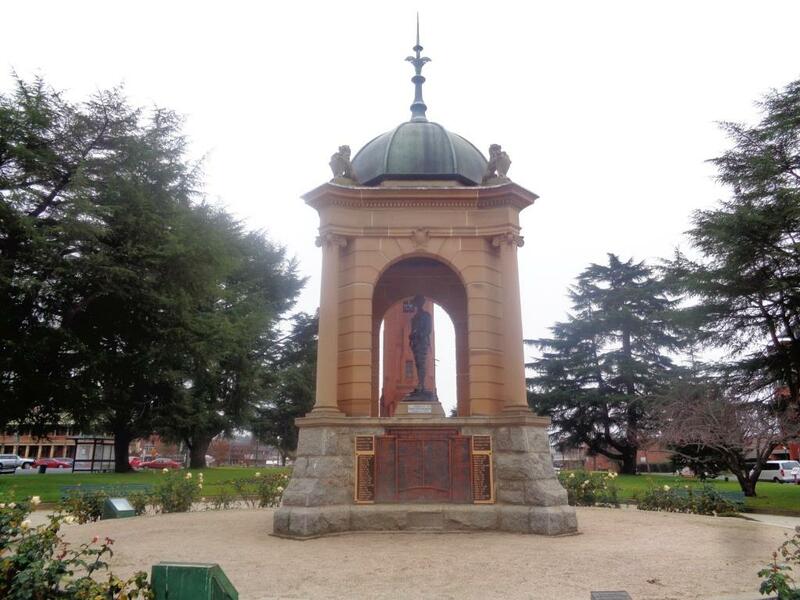 For the Gilgandra recruits— that gallant band of volunteers inaugurated by Captain T B. [sic] Hitchen — were entering the good old City of the Plains, and the Bathurst people had determined that the reception accorded them should be one worthy of the town and district. Enough has been said of the commendable nature of the scheme of Captain Hitchen, and the arrival yesterday of the ever-increasing band of men that goes to prove the value of the captain’s recruiting effort was made the occasion of a gala day in Bathurst, the attendance in the streets and elsewhere, and the enthusiasm displayed being typical of the high esteem in which the marching recruits are held. At the corner of Stewart and Lambert streets, where the procession entered the town proper, a sign was displayed on the balcony of the Hotel Dudley, which read: ‘Well done, Coo-ees! We welcome you, and wish you God-speed,’ and this formed a fitting word of welcome to the gallant little band. All along the streets to the King’s Parade, where the Union Jack and Australian ensign flew proudly aloft on the newly erected flagstaff, crowds of enthusiastic citizens lined the way, and united in the effort to make the welcome to the recruits a warm one. The procession was headed by a section of mounted police, behind which marched the City and Salvation Army Bands, discoursing excellent martial music. The local cadets followed, marching in good time ahead of scholars of the various schools and convents of the district, wearing the dainty costumes aired on the Belgian Day and Australia Day celebrations. His Worship the Mayor came next in a conveyance, followed by Mr A. G. Chiplin, in solitary glory in a hansom cab. The Military Band, under Mr. Lewins preceded the Gilgandra and other recruits, who were accorded a royal reception all along the route. “First Stop— Berlin,” read the inscription on one of the transport waggons, and each of the conveyances of the various units bore some similar indication of the determined spirit of the volunteers. The Civilian Rifle Club members marched behind the recruits, and were followed by a number of motor cars and other vehicles. The appearance of the banner “Bathurst Boomerangs” was the signal for an out-burst of emphasised applause, and the local quota to the strength of the contingent was accorded a brilliant reception. On the way to the King’s Parade the frequent call of “Coo-ee!” echoed in the air, punctuated by the musical clang of the bells of All Saints’ Cathedral and the cheers of the multitude. Bunting was prominent everywhere, and as the procession turned into Russell-street from George-street it passed beneath a string of flags and words of welcome. The scene when the recruits and others assembled at the Soldiers’ Memorial was a memorable one, and the remarks of the Mayor when welcoming the recruits were lost on the ears of the majority of the big assemblage. Nevertheless there was no mistaking the enthusiastic spirit of the multitude, and Bathurst may well feel proud of the greeting it accorded the band of gallant Empire defenders on their arrival. Mr Beavis, who was supported on the Memorial by Captain Hitchen, Major Wynne, Captain Eade, Sergeant Lea, Mr. Fern, M.L.A., Major Machattie, and others formally welcomed the recruits to Bathurst. He mentioned that the town had already spent £15,000 in contributing to the various war funds, and that 400 of its men had joined the colors, while doubtless from 500 to 1000 more would do so in the future. Captain Hitchen returned thanks for the reception accorded the recruits, which had been most flattering to himself and all concerned. O’Connell, Ann, ‘Coo-ee’, ‘Ashfield Answers the Call’, Ashfield History No. 20, Journal of the Ashfield and District Historical Society Inc., p. 42. 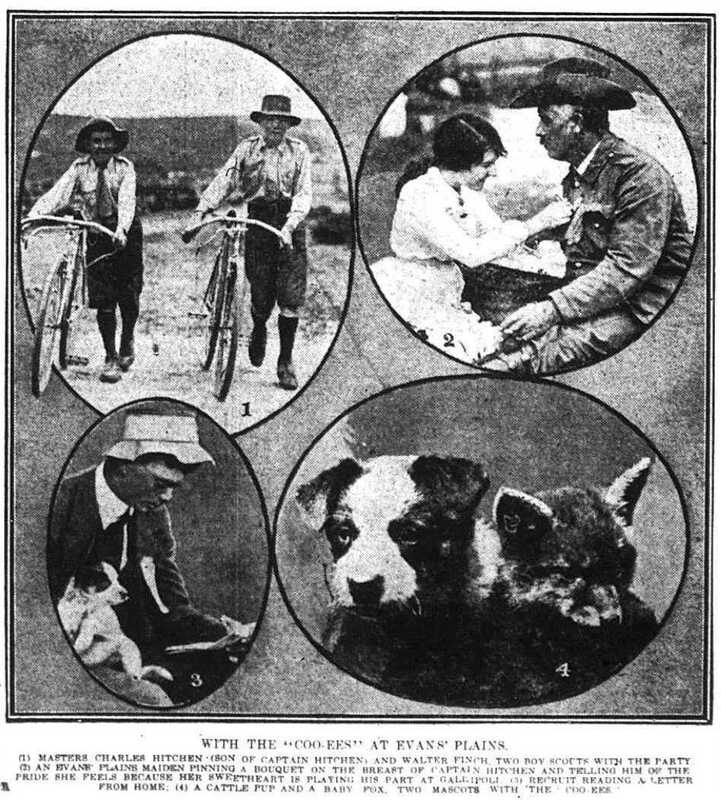 Transcription of an article titled ‘The Great Route March : the tremendous Bathurst welcome’ from The Farmer and Settler, 2 November, 1915, p. 3, [part 2 of 3]. The district band played the column out of town on Friday, leading the way from the showground along the beautiful willow avenue, over the bridge and out along the long, white road that leads Sydney-wards, over the mountains. The first portion of the day’s fifteen-mile journey to Yetholme was fairly good going, until Glanmire was reached at dinner time. Residents of Raglan co-operated with the Glanmire folk to provide lunch under the trees in Mr. Ivatt’s property at Glanmire. After being welcomed by Mr. J. Godfrey, the men “fell to” and soon evidenced their full appreciation of the good things provided by the ladies. The Rev. Crighton then addressed a few words of straight, manly advice to the men, and after the “Coo-ees” had cheered the ladies and others that had entertained them, they were themselves cheered along the road by the admiring throng. Hilly ceased to be a suitable adjective with which to describe the road then entered upon, but the boys swung along the mountain roads with a style about them that was a compliment to Captain Eade, and the non-commissioned officer that had joined forces at Bathurst for purposes of instruction and discipline. A little after five in the evening Yetholme was discovered by the boys to be one or two tourist accommodation houses and a post office, nestling in the mountains, and one of the prettiest spots yet encountered. Small as was the population, arrangements had been made by the recruiting association for the proprietor of “Brooklands Park” to provide sustenance for the two full platoons of soldiers that had marched in that afternoon. Mr. W. H. Berry, president of the Turon Shire Council extended a warm welcome to the boys, and after quarters had been taken up in the school grounds, tea was served in the large dining hall. Two sittings is the order of the day now that a hundred and fifty men have to be provided for, only the larger towns boasting a structure capable of seating the whole army at once. After tea it was proposed to hold a smoke concert in the dining room, but following a suggestion thrown out by the officers of the column, a camp fire concert was organised in the school grounds. A fair crowd assembled, and a very pleasant evening was spent, no fewer than three men coming forward to join, in response to the speeches of Messrs. C. W. Chiplin, Williams, Clark, Blackett, Lee, and Wynne. This addition to the ranks was all the more welcome because unexpected, nobody regarding such a small place as Yetholme in the light of a recruiting ground. One more man caught up on horseback from Glanmire. Mr. W. L. Garrad was a most energetic worker, as secretary of the local recruiting association; Mr. William represented Meadow Flat, and Mr. Chiplin spoke for Sunny Corner.